For a long time I was convinced that Toblerone tasted better in Switzerland. In 2011 I took some Toblerone bars from Bern to Calgary. A blind taste test ensued. Experts were consulted. Smell and taste were analyzed. Mouthfeel was evaluated. The deliberation was short and unanimous. I thought that this was down to some difference in production or higher chocolate standards in Switzerland. Imagine my surprise to discover that all, yes ALL, Toblerone bars are produced in Bern. Toblerone is a Bernese chocolate through and through. The original factory was in Bern's Länggasse, and all Toblerone was produced there until the 1980s. Today, that building is part of the University of Bern and is called UniTobler. In fact, there is still a Toblerone exhibition in the basement. Even more Bernese is the 'hidden' bear (the symbol of Bern) in the face of the mountain on the packaging. Can you spot it? In the 1980s, Toblerone moved to a bigger factory in Bern-Brünnen, where they continue to produce all the bars for the world market. Although Toblerone is no longer a Swiss company—it was bought by Kraft in 1990, which then became Mondelez—all production stays within Switzerland. (There have been a few exceptions over the years—according to Wikipedia in the 70s and 80s there were also some foreign factories producing Toblerone, but currently it is all produced in Switzerland). So what made the Swiss Toblerone win the taste test? And now for a little history. In 1908, Theodore Tobler (and his cousin Emil Baumann) invented the bar by mixing milk chocolate with a nougat of almonds and honey. (For a first hand look, plus a peek into the Toblerone factory, check out this promotional video where reluctant Anna, a professionally trained chocolatier, makes it from scratch). The nougat part was similar to the Italian confection Torrone, so Theodore put that word together with his last name and came up with Toblerone. Although it's the Matterhorn on the packaging, that peak probably didn't inspire the pyramidal shape. Tobler's own sons suggested that it was actually inspired by the formations of dancers in the Folies-Bergère. Tobler filed for a patent in 1909 for the manufacturing process, and later that year trademarked the name. (As a side note, the patent office in Bern where Tobler's claim was filed was the very same where Albert Einstein was employed a couple years later. And it was during his time in Bern at the patent office that he discovered his famous Theory of Relativity—as the Bernese are extremely fond of mentioning). Toblerone survived the stock market crash of 1929, and both World Wars. It wasn't until 1969 that the company tried its first variation—dark chocolate—and four years later, white. Now you can have Toblerone in numerous sizes and flavours, including coconut, fruit and nut, and crunchy almond. 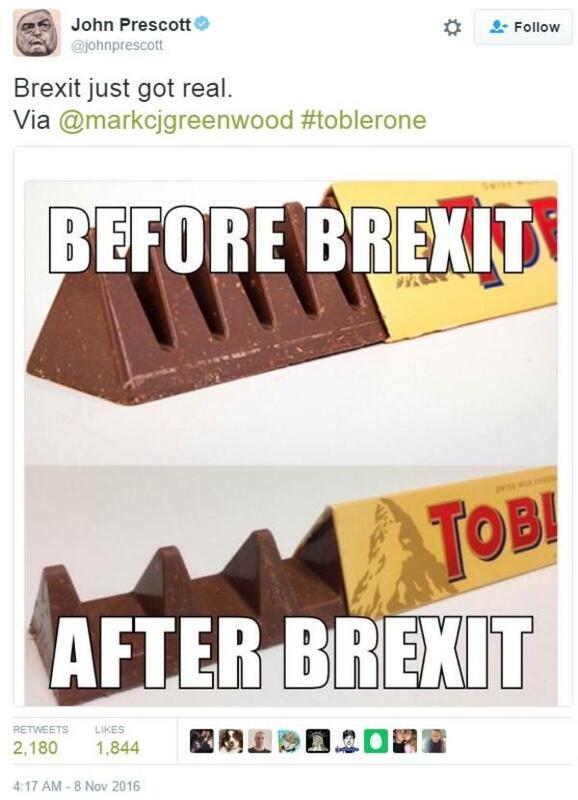 Toblerone even manages to stay in the news. Just last year the company created huge controversy in its UK market by increasing the gaps between the pyramids.